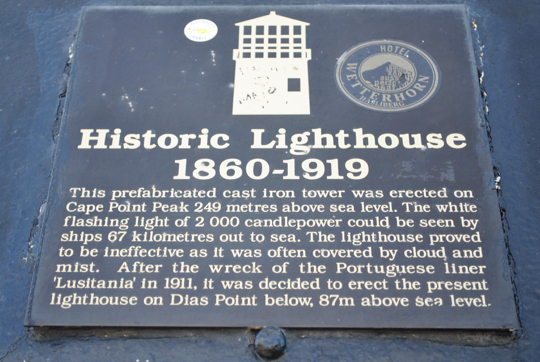 To me it would seem totally logical to build a lighthouse as high above sea level as possible. 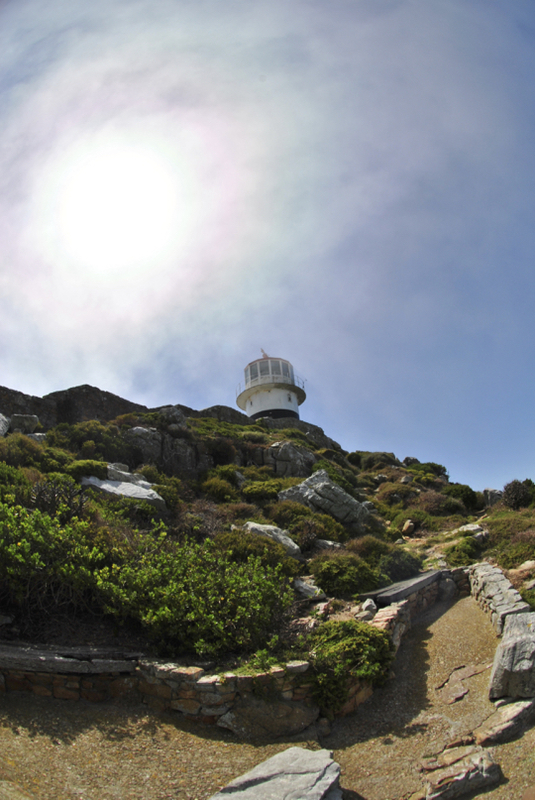 As we saw with the old Cape Point lighthouse, there is such a thing as too high, particularly when you’re building in an area that is prone to heavy mist and fog. 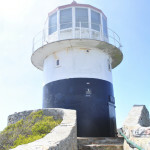 The most notable shipping casualty that occurred after construction of the old Cape Point light was that of the Lusitania, wrecked on Bellows Rock in 1911. 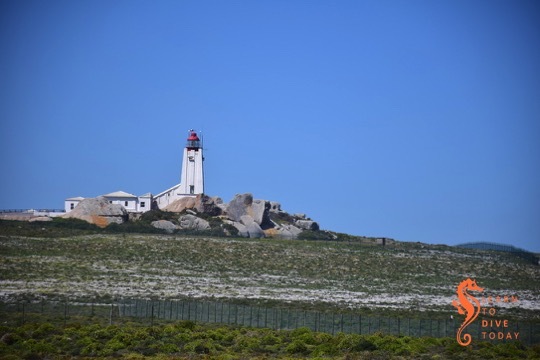 A new lighthouse was planned, along with a light at Slangkoppunt in Kommetjie, to replace the old light at Cape Point. 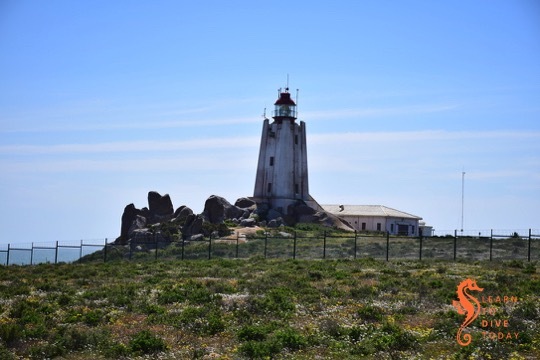 The new lighthouse was built on a 15 metre high pinnacle of rock called Diaz Point, which was dynamited to form a flat platform upon which the lighthouse would be built. 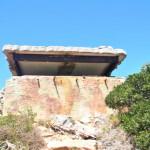 Building materials were hauled by oxen from Simon’s Town, and transported by tram down a track on the cliffs. Most of the way the gradient of this tram track was 1 in 4; for a short stretch it was 1 in 2. This is incredibly steep. At the end of the tram track, the building materials were lowered by crane onto a ledge. Building sand was excavated from a cave at the bottom of the cliff, and carried up to the platform on which construction took place. Water was brought close to the building site by trolley, and piped down onto the location. 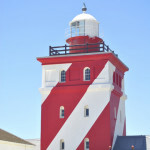 Like the old lighthouse, the new lighthouse is nine metres high, but instead of cast iron, it is constructed from masonry and the tower is square. The lantern house on top is white. 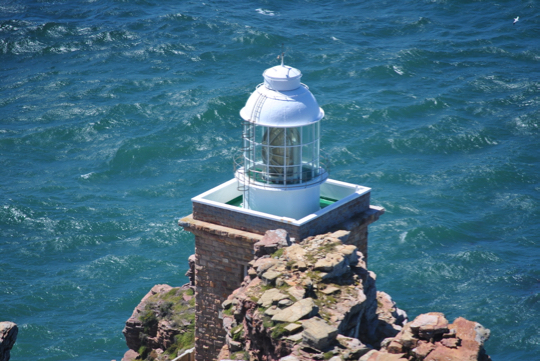 The new lighthouse’s elevation is 87 metres above sea level, giving it a range of visibility of 32 nautical miles. 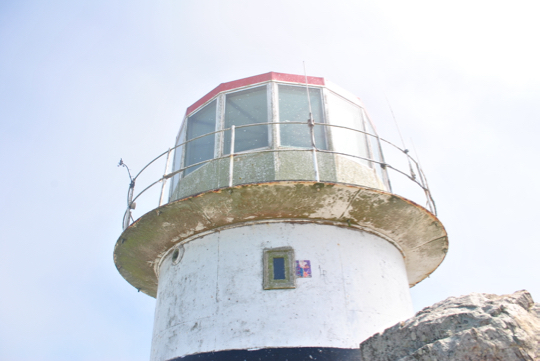 The fully automatic light flashes three times every 30 seconds, and there is a subsidiary red light in the base of the lighthouse facing towards Anvil and Bellows Rock. 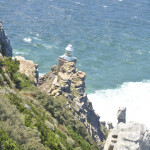 This light is only visible from the sea, if you go around Cape Point to the western side of Cape Point. 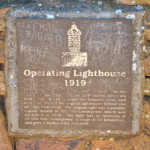 On 11 March 1919 the new lighthouse was commissioned (put into service). 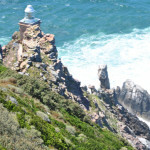 The view from this lighthouse covers a full 353 degrees, with seven degrees obscured by Da Gama Peak behind it. It was manned for a time, but is now automated. 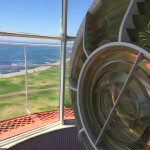 The public is not allowed to visit the new lighthouse, or even to get particularly close to it. 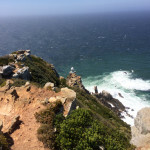 It can be viewed from a viewpoint at the end of the Lighthouse Keeper’s Trail, a highly recommended short walk from the old lighthouse at Cape Point. 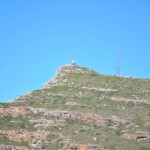 Along the way you will see the remains of World War II bunkers and a radar station, and you will traverse the most fantastically narrow ridge of rock (in perfect safety). The wind is likely to be extremely strong, whatever time of year you go – dress accordingly. 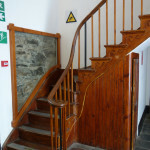 Also note that the walk does not take nearly as long as is suggested by the signage at the start. It is approximately one kilometre each way. 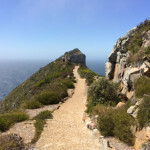 If you’re a fan of visible shipwrecks, may I recommend the Shipwreck Trail in the Cape Point section of Table Mountain National Park? 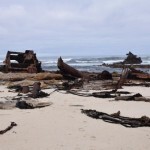 I’ll write a separate post just about the trail, but this post and the one that follows (about the Nolloth) concern two shipwrecks, high and dry on the shore, that can be see on the route. The SS Thomas T Tucker was an American-built Liberty ship. These cargo vessels were of a standardised design and were built in great numbers, and at great speed, during World War II. 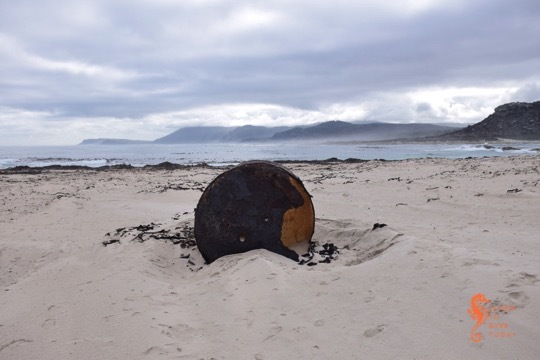 They were used to transport war materiel to the Allied troops, and this is what the Thomas T Tucker was busy doing when she found herself off Olifantsbos in November 1942. She was on her maiden voyage from New Orleans to Suez, hugging the coast in a thick fog for fear of German U-boats. When she ran aground on 27 November (our wedding anniversary! 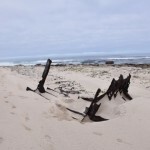 ), her captain reported that the ship was aground on Robben Island, which is over 40 kilometres to the north. 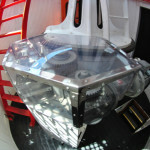 The ship’s compass was found to be out by 37 degrees, which may have contributed to the accident. 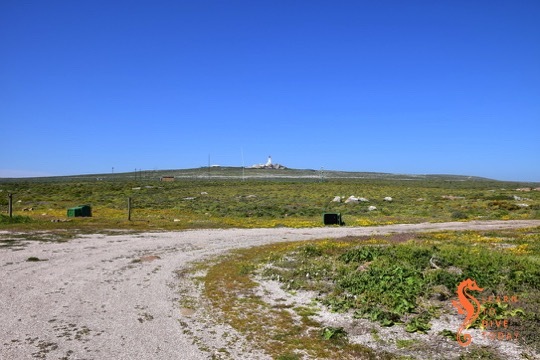 Today the Thomas T Tucker is beautifully spread out on a beach about two kilometres from the parking area at Olifantsbos, inside the Cape Point Nature Reserve. She was 135 metres long, so there was a lot of ship to distribute. 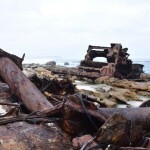 There are some great pictures in Shipwrecks of the Western Cape by Brian Wexham, from (I think) the 1980s. They give a good idea of how the wreck has deteriorated. You will first come upon one of her boilers, high up on the beach, close to a small headland. 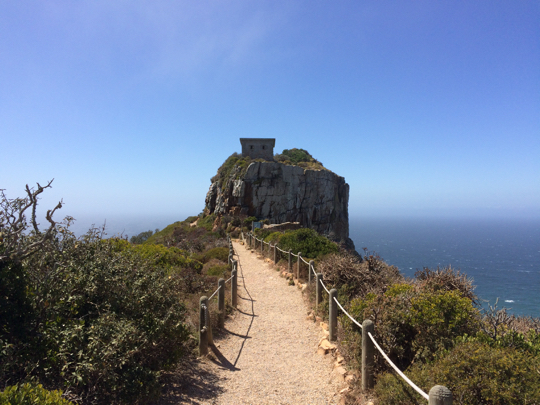 If you look back the way you’ve come (first photo, above) you can see Misty Cliffs, Scarborough and – perhaps – Slangkop Lighthouse. 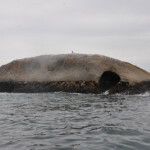 Beyond that she is in several large pieces on the rocks, and higher up the beach. A third (bonus!) 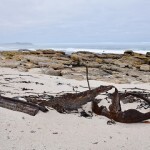 section of wreckage lies a couple of hundred metres further along the Shipwreck Trail (also called the Thomas T Tucker trail), so isolated from the rest of the wreck that I at first thought that it came from a different ship. 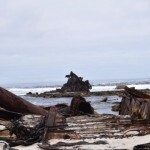 We visited the wreck of the Thomas T Tucker an hour or two after high tide. 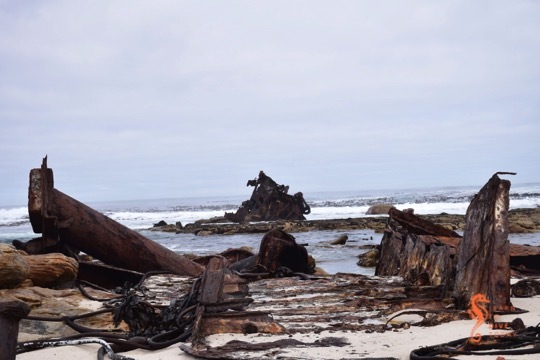 At low tide, all the pieces of the wreck are accessible; we could not reach the most distant piece without getting our feet wet! 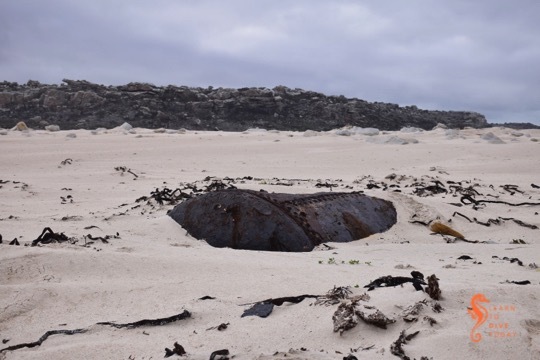 There is some wreckage that isn’t visible, lying in the shallow water, which you can visit on a scuba dive if you get the appropriate permission to have dive gear on a boat within the exclusion zone around Cape Point. We were lucky to have fairly dramatic skies for photography. 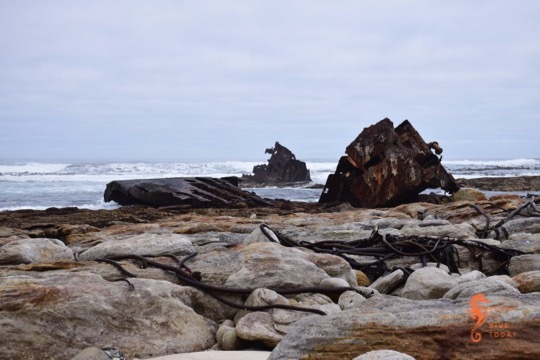 The way in which the wreck is scattered is a testament to the exposed nature of this coast, and the power of the Atlantic Ocean. 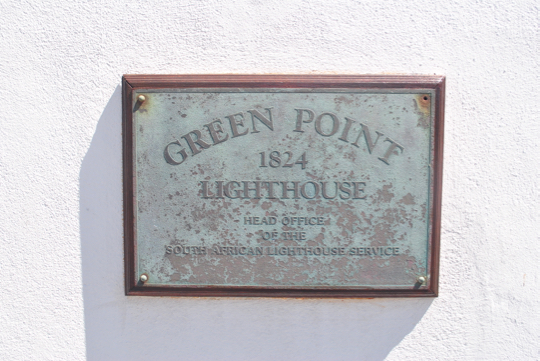 Green Point lighthouse is South Africa’s first lighthouse, commissioned in 1824, and is currently the headquarters of the South African lighthouse service. 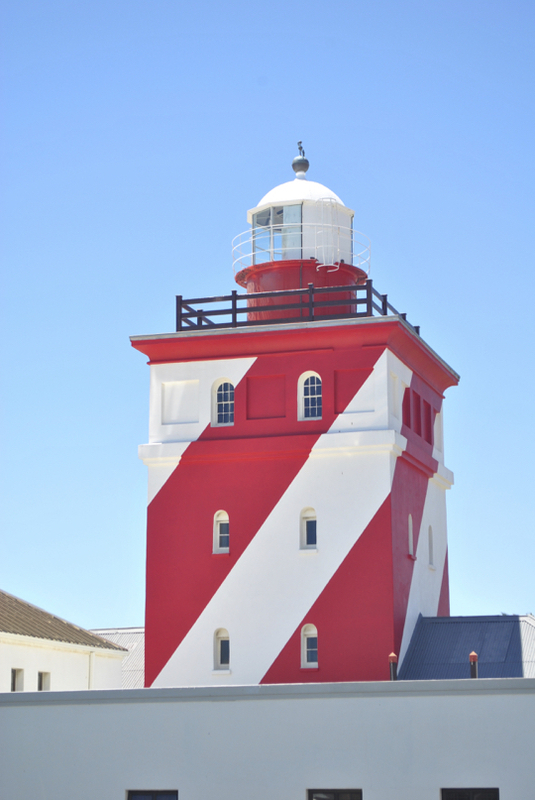 The lighthouse is instantly recognisable, constructed from immensely thick masonry and painted with red and white diagonal bands. The walls at the base of the tower are almost two metres thick, because the building material is unworked stone bound by lime mortar. 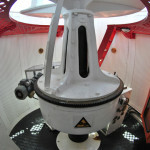 The tower is 16 metres high, with its focal plane 20 metres above sea level. Currently the light is an 800,000 candela metal halide lamp. These facts mean that the light can be seen from 25 nautical miles away. 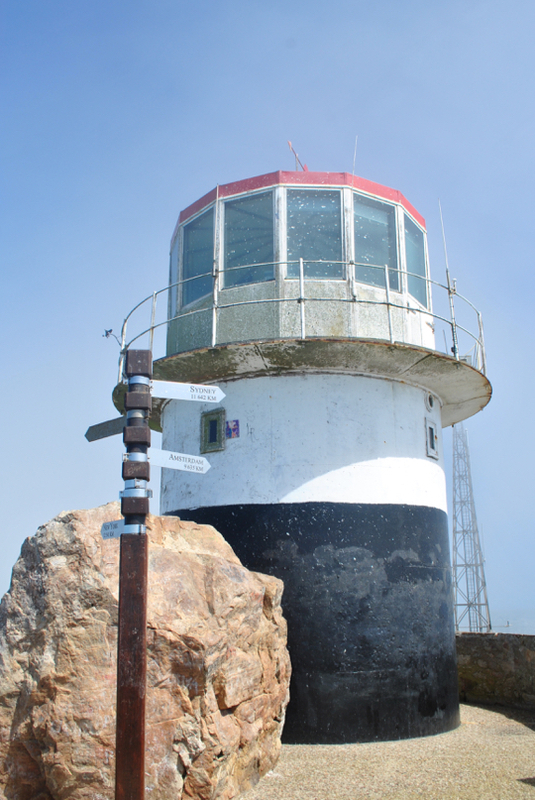 The sound of its fog horn (of a variety called a nautophone) will also be familiar to local residents and boaters. We listened to it for ages while waiting for last year’s Freedom Swim to commence. 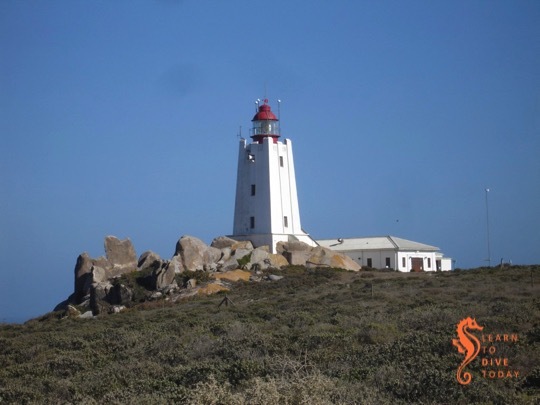 Green Point lighthouse works in conjunction with Milnerton lighthouse and the Robben Island light to guide vessels safely into Table Bay, past Robben island and avoiding confusion from the myriad city lights. 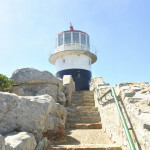 Technically the lighthouse is situated in Mouille Point. 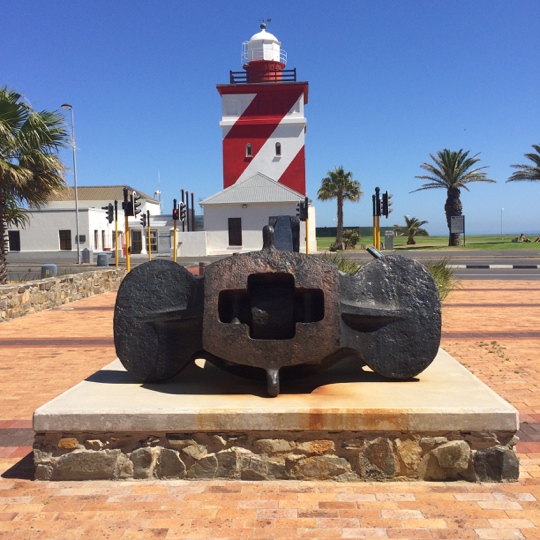 There used to be a Mouille Point light (commissioned in 1842) close to where the wreck of RMS Athens lies. 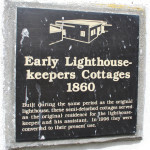 It was decommissioned in 1908 when a light was established on the breakwater nearby. 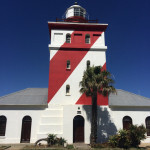 The base of the decommissioned Mouille Point lighthouse still survives at Granger Bay, and when I find it and photograph it I will show it to you. 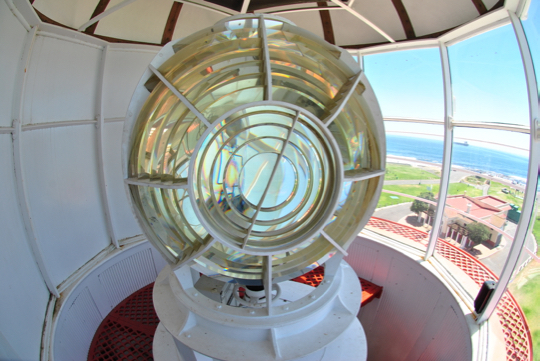 The lens, a thing of beauty, was supplied by Chance Brothers; their handiwork is also visible at the Slangkoppunt lighthouse. 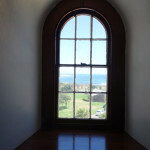 The lighthouse is open to the public on weekdays between 10.00 am and 3.00 pm, for a cost of about R14. 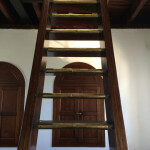 You can climb up the tower and also browse the fascinating historical displays inside the building. 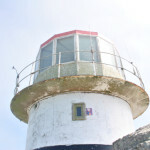 You could also fantasise about working for the lighthouse service, and crash back to earth with the realisation that in today’s age of unmanned lights, it’s a far less romantic job than you think it might be. One day in October last year (there are no acceptable excuses for the delay posting this, so we’ll just leave it at that), Seahorse and her skipper were chartered by a multi-disciplinary team who are working on a project called Sea-Change. 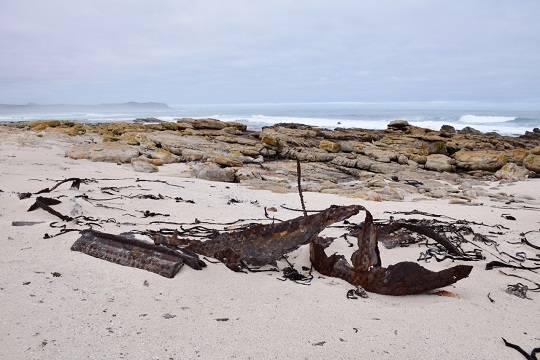 If you’ve visited the Sea Point promenade recently, you might have seen a beautiful array of mini-billboards featuring photographs of sevengill cowsharks, kelp forests, and other marine life, including recreations of how early humans may have interacted with the marine environment in the Cape. 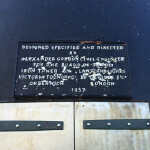 The Sea-Change team wanted to find a co-operative whale to swim with and film, being in possession of the necessary permits (many pages of paperwork). 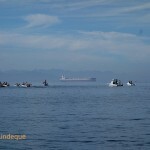 It was late in the season for whales in False Bay, and we spent a morning looking for them without any luck. 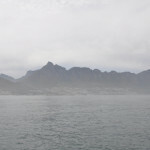 Reports of whales on the Atlantic seaboard led us to Hout Bay about a week later. 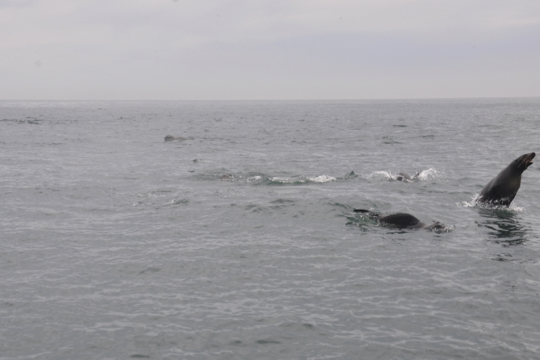 It was a misty day, and we went as far north as Clifton without seeing any whales. 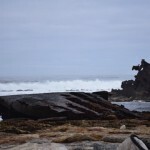 We did see a large sunfish and lots of seabirds (including rows of terns perching on pieces of kelp), and we spent some time at the seal colony at Duiker Island, where the team spent over an hour in the water… without wetsuits! 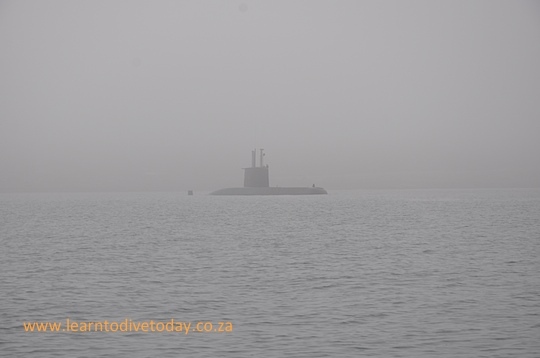 Just as we were about to call it a day we spotted a whale at the entrance to Hout Bay – it may have been there the whole time but the mist was too thick for it to be seen. Unfortunately it didn’t want its picture taken, so we had to call off the search for another day. 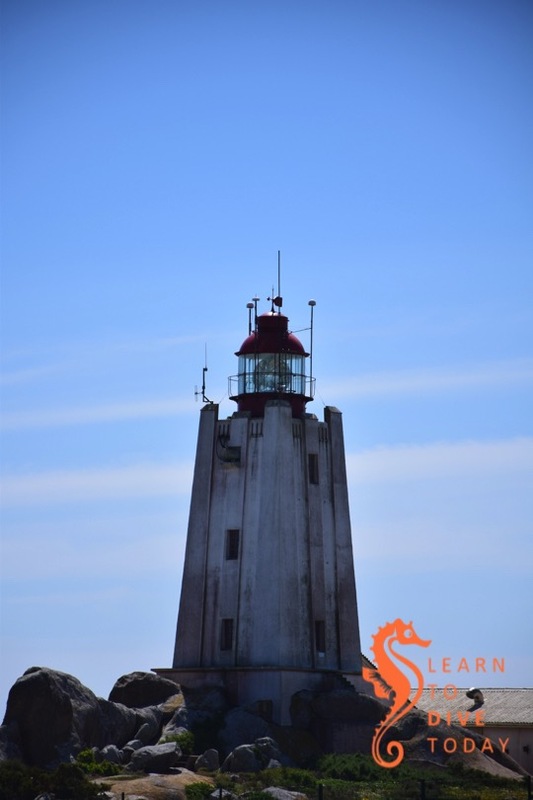 Check out the Sea-Change website for more information on the project. There’s also a just-published feature about the project in Africa Geographic that I highly recommend you check out. 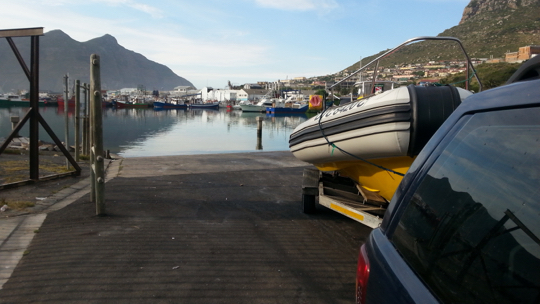 Sunday: Launching from Simon’s Town jetty for an undisclosed location in False Bay! 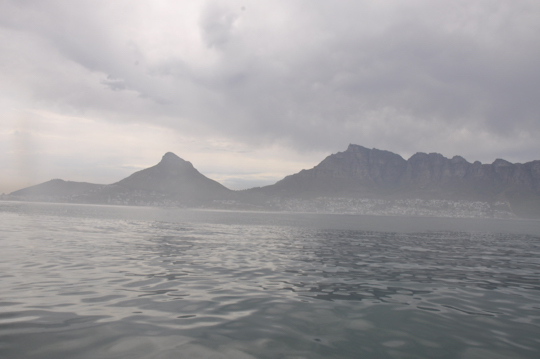 The weekend started with a foggy wait in Table Bay for the fog to clear before the Robben Island Freedom Swim could get underway. Once it had lifted we were once again treated to a Le Mans style start your engines and full throttle race to Robben Island.There are some pictures on facebook. 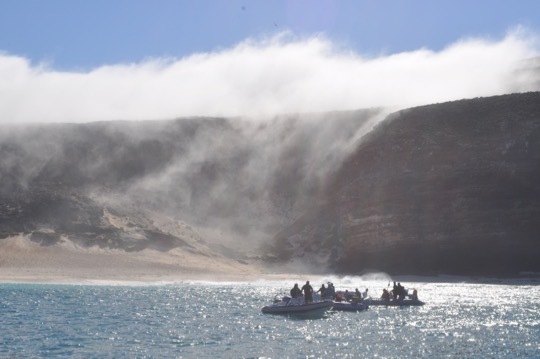 We had very clean water for diving in False Bay on Sunday but the fog made it a little unpleasant on the boat because of the other boat traffic. The viz has slowly dropped off during the week. On Monday we were out at Dias Beach inside the Cape Point reserve for another swim event and the water was very clean there and inside False Bay, but by late afternoon it had got a lot darker. Some photos from that day are also on facebook. The water does not look spectacular anywhere. 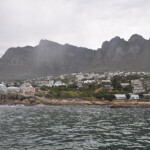 Hout Bay is not that clean and Table Bay very patchy. False Bay looks better than anywhere else. 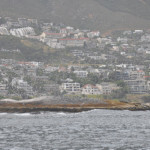 The downside is that we are forecast to have a southerly swell which does not do False Bay any good. I am at another Robben Island swim event tomorrow so I will have a better idea of the conditions there tomorrow evening. 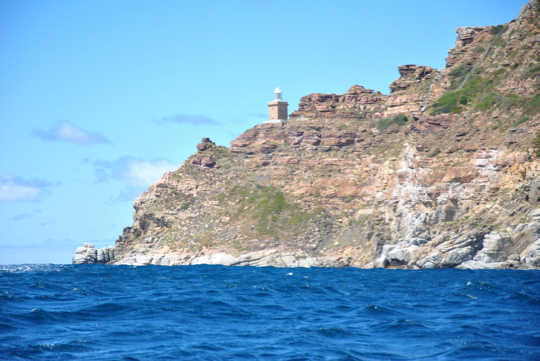 The diving plan for the weekend is thus shore dives on Saturday, and boat dives in False Bay on Sunday. I’m not going to select sites in advance – we’ll go wherever we can find clean water. Sunday: To be decided, based on weather and conditions. Text me or reply to this mail to be kept in the loop, or to book dives. I know that not everyone is a sailing fanatic, but there are currently seven world class racing yachts doing battle in the Atlantic Ocean as the Volvo Ocean Race fleet head for Cape Town. 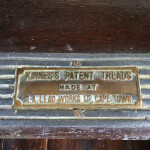 Take a look at the website and facebook page if you are interested. These engineering marvels sailed by some of the world’s best crew are due to arrive in Table Bay between the 2nd and the 6th of November. 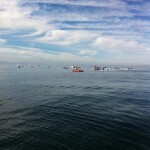 I am going to be out on the boat in Table Bay with my camera. Text me if you want to be on the list to be notified of this. I have strong ties to Denmark so I am rooting for Team Vestas Wind, but it is a 6487 nautical mile leg – they started in Alicante in Spain – so it’s a long, hard haul and anything can happen. We dived the wreck of the Maori and the Sentinel on Saturday last weekend and had around 10-12 metre visibility with chilly 9 degree water. Sunday was blown out. The weather this week has been all over the place. 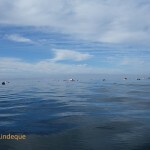 On Monday we dived False Bay and had really lousy viz with a grumpy easterly swell. 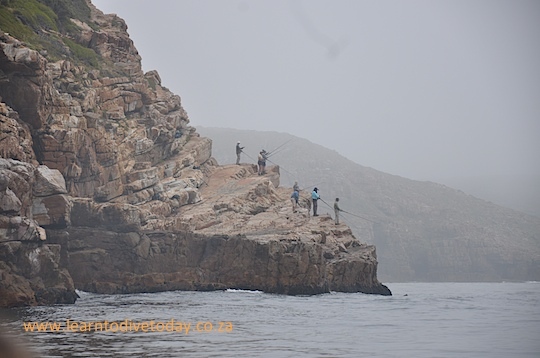 Yesterday we were out on a film shoot project and in thick fog we went around Whittle Rock, down to Rocky Bank and then across to Cape Point. 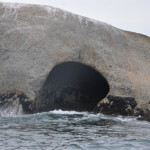 The water was dark brown all the way out to the entrance of False Bay, where it cleaned up a bit, and once back inside the Point the darkness returned. 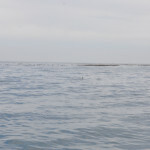 We jumped in at Partridge Point for a brief snorkel with seals in around 2 metre or less visibility. All this means it will be an Atlantic weekend. The winds are forecast to blow somewhere between 10 and 30 knots depending on which forecast you rate the best. 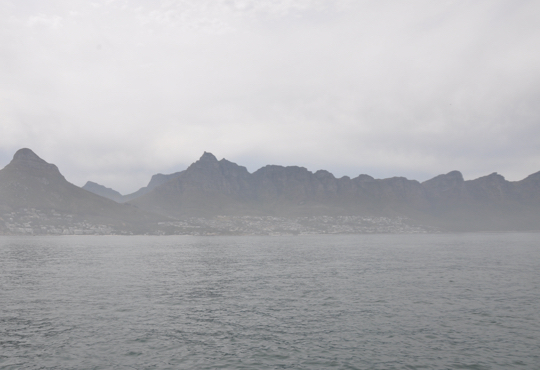 The water does not look very clean in Hout Bay or Table Bay today, but the wind tonight and all day tomorrow should fix that. I will launch from OPBC on Saturday at 8.00 am for a double tank dive and may do a third launch if the conditions are good. The wind is meant to blow harder in the afternoon but we will play it by ear. I will wait until Saturday afternoon to plan for Sunday once it’s clearer what the conditions will be. 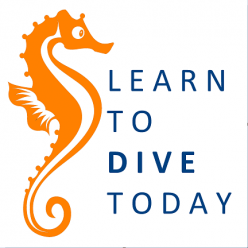 If you want to dive, reply to this mail or text me and I’ll keep you in the loop. 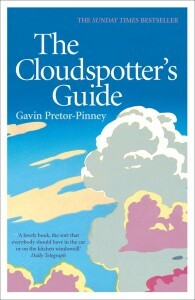 Gavin Pretor-Pinney is the founder of the Cloud Appreciation Society (over 35,000 members), and this book is a natural outflow of his immense, self-professed love for clouds. I’m mentioning this book here not because it mentions scuba diving even once, but because clouds form part of the weather system that is driven by the ocean, and furthermore affects all our activities on and under the sea. And, because paying attention to the rhythms of the weather is important amid the regimented humdrum of everyday activities, and is one of the things that enables me to live a relatively sane life. The Cloudspotter’s Guide is divided into chapters by type of cloud. Pretor-Pinney explains how to identify the different types, how they form, and how they fit into the greater scheme of things. I find meteorology hard to keep in my head, so it’ll bear another reading, but I learned several (I suspect extremely basic – deep ignorance as my starting point) things about how clouds are formed that have improved my understanding of how the world works. This is a great book to take on holiday, alongside your bird book, or to keep near a window so that you can practise identifying the clouds that roll overhead, and start to understand the type of weather that they presage. 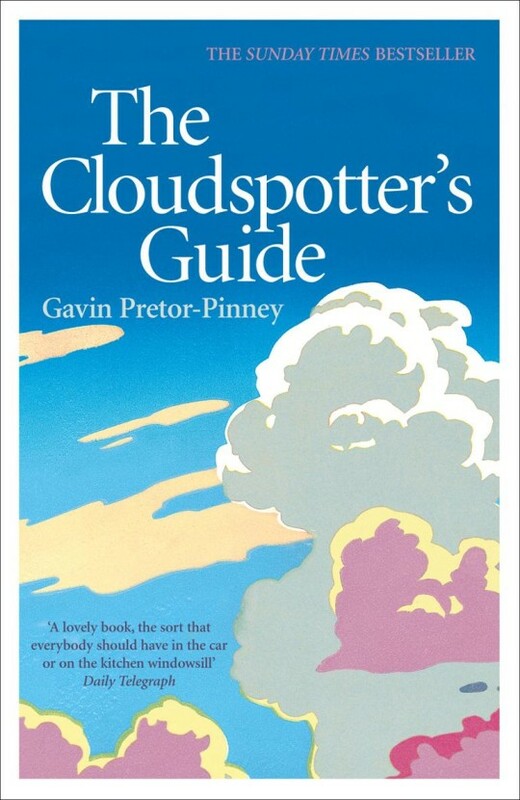 The other book I’ve read by Pretor-Pinney is The Wavewatcher’s Companion, and The Cloudspotter’s Guide is the same kind of deceptively simple, amusing take on a fairly complex phenomenon. By the end of the book you’ll have chuckled several times, admired some remarkable photographs of clouds (contributed by Cloud Appreciation Society members), and contemplated booking a plane ticket to Cairns, Australia in order to check out the Morning Glory cloud in person. You’ll also have learned quite a lot. Did you know, for example, that the contrails (condensation trails) created by plane traffic contribute more to global warming than the carbon emissions of those same planes? The contrails are an artificial cloud that – by increasing cloud cover – trap heat at the earth’s surface and prevent it radiating out into space. You can read more about this here and here – the circumstances that allowed scientists to come to this conclusion were highly unusual. You can get a copy here or here, otherwise here if you’re in South Africa. You can also grab the companion volume The Cloud Collector’s Handbook, which is an identification guide combined with a checklist (for serious work in the field), here. 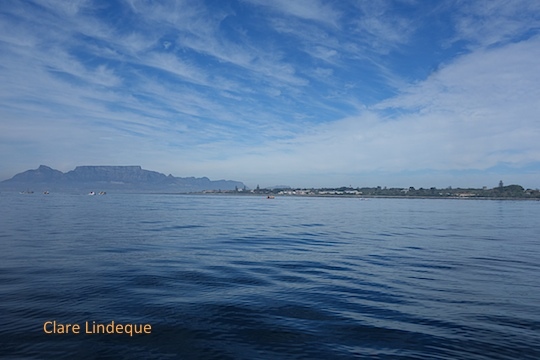 One of the most enjoyable parts of the Freedom Swim (from Robben Island to Blouberg, on May 3rd) was the time we spent waiting outside Murray’s Bay Harbour on Robben Island, where the swim was to begin. 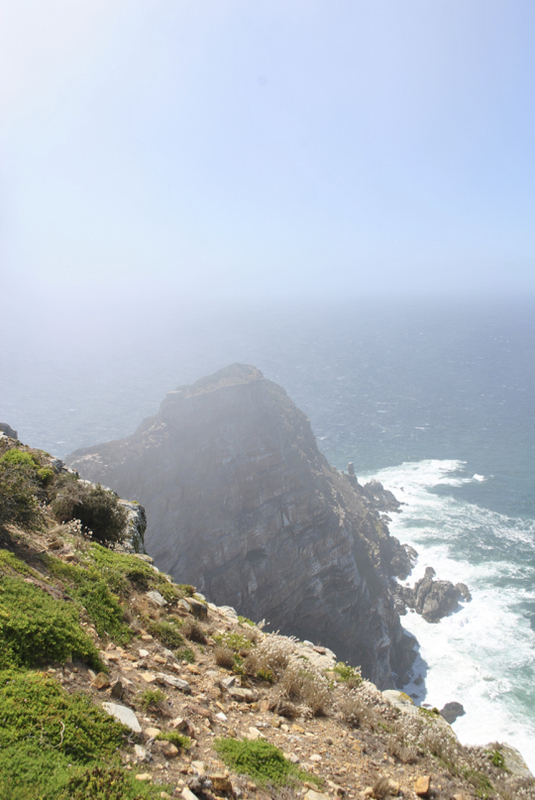 Once we received the all-clear to head from Granger Bay to the island, we saw that the mist only extended a short distance out to sea, and it was clear at Robben Island. 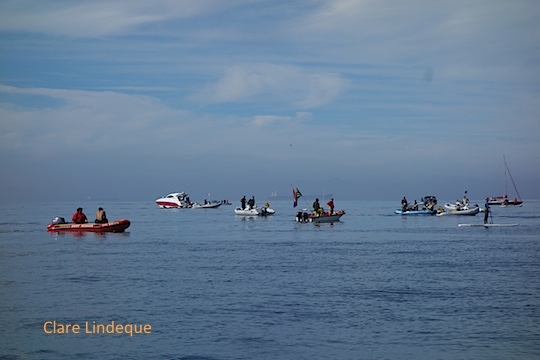 A motley assortment of boats – from a huge yacht to a two metre long rubber duck with a single 15hp motor, as well as some rescue boats, stand up paddle boarders, and kayakers – spent nearly an hour bobbing gently on the mirror-like ocean. A festive atmosphere prevailed. 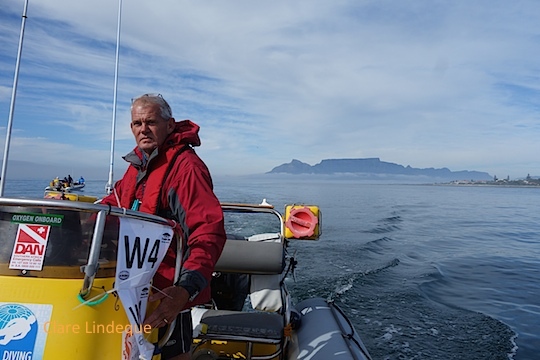 In order to assist their swimmers to identify them, boats were adorned with flags, balloons, inflated papsakke, towels, and other colourful items. Stand up paddle boarders moved through the crowd of boats, and we enjoyed a strange stereo effect when radio announcements were made by the organisers. 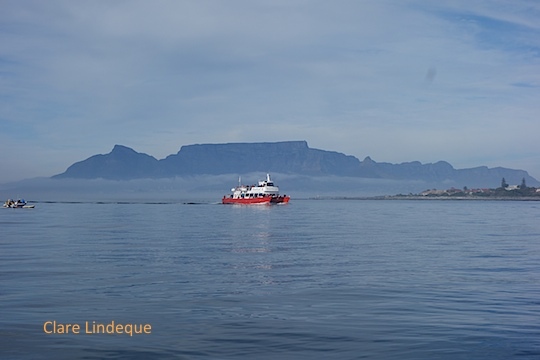 The expensive, fancy Robben Island ferry is broken (as it seems to have been almost since the moment it went into service), so Nauticat, the seal watching boat from Hout Bay, is doing duty as one of the ferries bringing visitors to the island until a new ferry is obtained. The ferries practically handbrake turn into the harbour when they arrive, slowing down not at all, so there was a delay at the start of the swim while we waited for a ferry to complete its arrival. 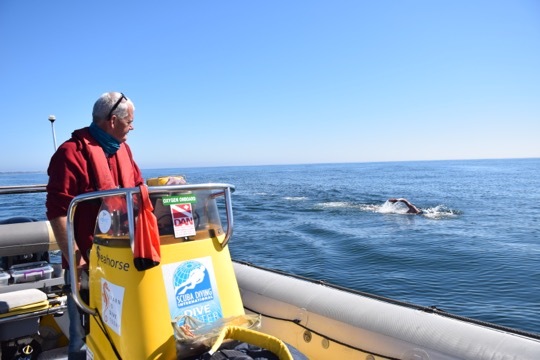 We could hear the countdown over our VHF radio for the start of the swim for participants wearing swimsuits, and about half an hour later the wetsuit swimmers hit the water. 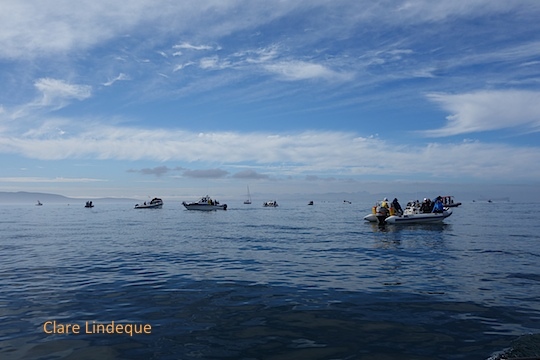 They started inside the harbour, so it was a few minutes before the first swimmer emerged from the harbour entrance and headed for the buoy that marked the start of the course.